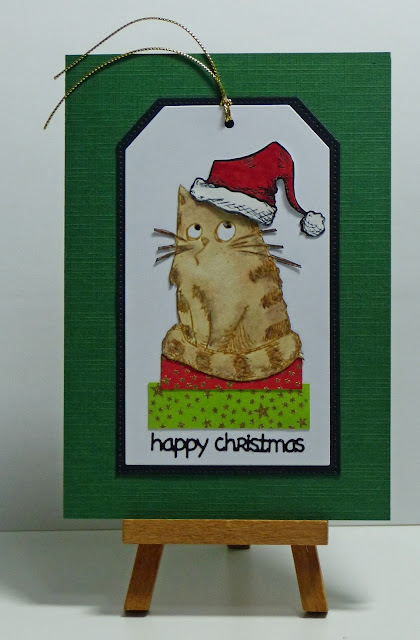 Cathy's Card Spot: Christmas ginger cat. Hi everyone, I'm getting to the end of making Christmas cards, writing them up and posting. I'm hoping they still get to their destinations in time. Everything has been so "last minute" this year! This is another Katzelkraft cat. I love his expression! He is coloured with prismacolour pencils and fussy cut. The presents were stamped with a star stamp and gold embossed, then diecut and inked with distress inks. The hat was fussy cut and coloured with distress markers. I'm linking up to the challenge at Simon Says Stamp Monday where the theme is Christmas/winter holidays. At Addicted to Stamps & More the theme is make your mark. I'm taking the anything goes option. 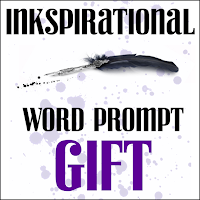 At Inkspirational the word prompt is gift. Hero Arts tiny star background stamp; versafine ink, gold ep; Katzelkraft cat stamp, versafine ink & clear ep; distress ink and markers; Stampers Anonymous crazy things hat stamp; MFT tag stax dies; prismacolour pencils; sentiment sticker. Cathy, your lil ginger kitty is adorably decked out in a festive scene. So cute. Oh he’s hilarious, such a wonderful expression on his face. Thanks for playing at the HLS Christmas challenge. What a cute kitty and the santa hat is priceless! Love your fun design! Thanks for sharing with us at Inkspirational! What a charming tag! I love how your cat has such a fabulous expression and how you brought it to life so well with your coloring skills. I also adore the sentiment and think the font is perfect! Happy holidays to you and thank you so much for sharing your talents with us for this week's Simon Says Stamp Monday Challenge! Fabulous Christmas card Cathy, he looks so very cheeky, I do wonder what he has been up to. Hope your cards are nearly all done and dusted. That cat is just priceless - especially with a Santa hat on! Fabulous!!!! Happy Holidays to you, Cathy! Fun card. Love the look on the kitty's face! Your coloring is fabulous! 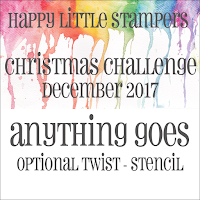 Thank you for joining us at Happy Little Stampers Christmas. super cute card...the look on the cat is hilarious. Wishing you a Healthy and Crafty New Year. Hugs Mrs A.